The beautiful weather has finally arrived (or at least it has for most of us) so why not get outdoors and enjoy it. 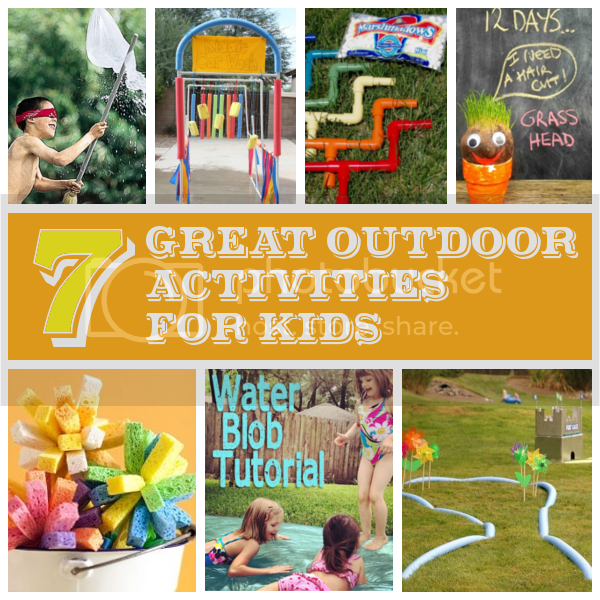 These outdoor activities are sure to entertain your kiddos for hours. Most of them are simple to make and fairly inexpensive. Have a Water Fight. Make your own sponge balls by cutting a sponge into strips then tie a few of the pieces together using dental floss. Submerge your sponge balls in water and let the fun begin!! Full directions and images found at One Charming Party. Turn your Yard into a Golf Course. Pin pool noodles to the ground using garden stakes. Let the kids decorate with cardboard castles and egg carton flowers. Photo from Spoonful. Grow Your Own Grass Head. This adorable grass head was made from old tights. Toss in some grass seed and soil, pinch a little nose, and let your kids add a silly face. You should see "hair" growing in a day or two. once it gets tall enough let the kids have even more fun by giving them some funky hair styles. Full directions and images found at Kids Crafts. Make A PinAqua. Fill a bag with water and tie it in a tree or other high place. Let the kids take turns swinging at the bag while blindfolded. Full directions at Spoonful. 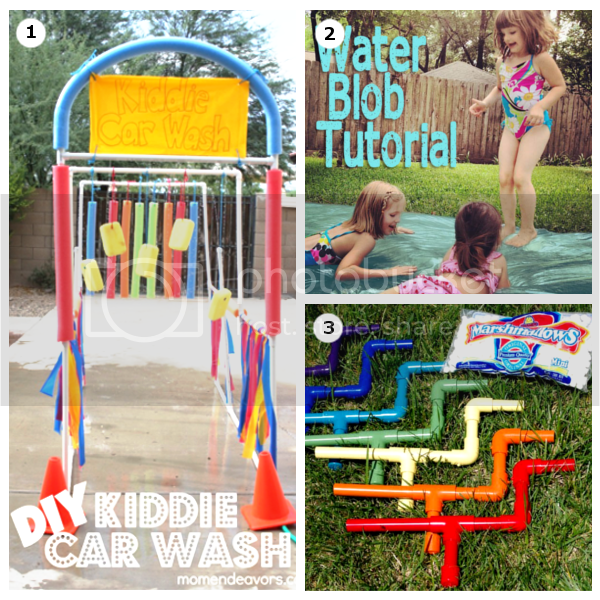 Set up a Kiddie Car Wash. Built with plastic pipe, pool noodles, and sponges, this fun water activity is simple to put together and will provide hours of fun. Let the children run through it or even ride their bikes through. Full directions and images found at Mom Endeavors. Jump on a Water Blob. Tape together two sheets of plastic sheeting, fill with water, and let the fun begin. Full directions and images found at Clumsy Crafter. Start a Marshmallow Fight. 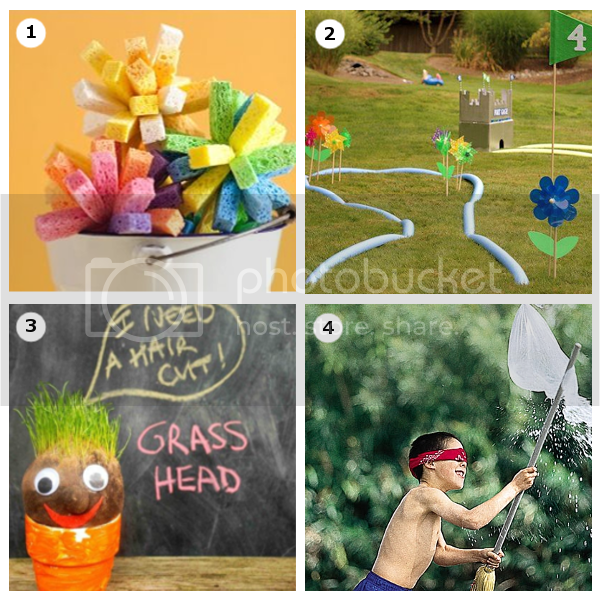 These fun marshmallow shooters are easily constructed with plastic pipe and a few fittings. Paint them bright colors for added fun! Full directions and images found at Happiness is Homemade.